Amblyopi or Lazy Eye treatment without a patch! Amblyopia/Lazy Eye treatment without patching! We are proud to offer the Shaw Lenses. 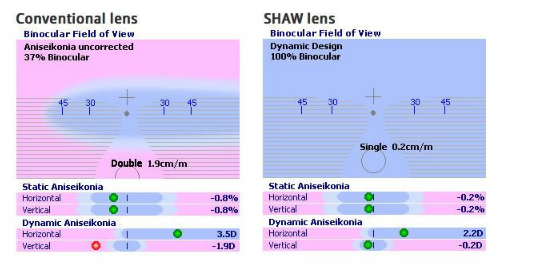 Traditional lenses correct each eyes vision and then combine the image, while Shaw lenses correct for the final result of both eyes working together. Shaw lenses are different then regular glasses. They offer more comfort, better vision, and an improved method for vision therapy and Amblyopia. Unlike traditional glasses which correct each eye individually and then combine the image, Shaw lenses correct the combined vision from both eyes. This prevents a lot of the strain, headaches and fatigue that come from correcting vision in a way that does not have negative side effects. What are Shaw Lenses For? Shaw Lenses are designed to provide vision correction for the sum of both eyes together by equalizing retinal image sizes. Whats so great about Amblyopia/Lazy Eye Treatment Without Patching? Amblyopia treatment is most effective when practices diligently at the youngest possible age. The common approach to Amblyopia treatment was to patch the stronger eye, forcing the other eye to learn to compensate. Because of the emotional and visual difficulties with patching, vision therapy doctors and parents found it very difficult to get kids committed to wearing their patches. With Shaw Lenses, young patients have no problem wearing them because of the comfort and improved vision that is experienced. How Do Shaw Lenses Work? Amblyopia/Lazy Eye is caused by the brain and not a problem with the eye. Amblyopia/Lazy Eye is best treated as young as possible, there is a debate if anything can be done after the age of 8 or 9. Because the symptoms are so similar (focus, difficulty reading, difficulty concentrating, many kids with Amblyopia are misdiagnosed as having ADHD. Shaw lenses are a massive leap forward for vision. Using sophisticated algorithms and analysis of of each eye, these lenses actually model the eye rotation in order to predict and prevent the distortions created by traditional lenses. Essentially, these lenses take into account how your eyes work together in order to deliver truly binocular vision.